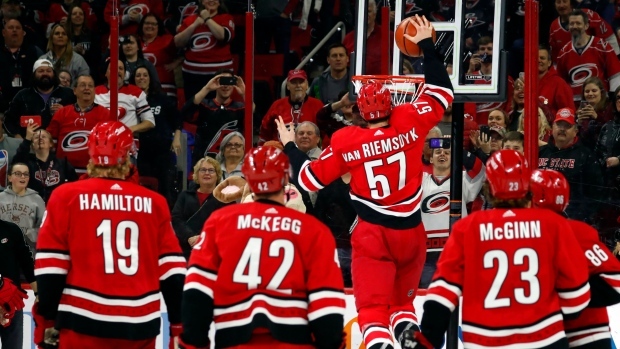 RALEIGH, N.C. — As the final minutes ticked down off the clock Saturday night, the nearly sold-out crowd at PNC Arena began chanting: "We Want Play-OFFS!" at high volume and in perfect unison. The Carolina Hurricanes are close, and they and their post-season-starved fans can feel it. Teuvo Teravainen had a goal and two assists and the Hurricanes kept pace in the playoff race with a 5-1 win over the Minnesota Wild. "Our fans are really getting into it and helping us. That was nice to hear," Teravainen said. "Every game is huge for us right now. Hopefully we can keep building here." Eric Staal scored and Devan Dubnyk made 28 saves for the Wild, who dropped out of the eighth and final playoff spot in the Western Conference with the loss and Colorado's 4-2 win over Chicago. Minnesota played without leading scorer Zach Parise after he took a high stick to the face against Washington on Friday. With the Wild lacking their primary scoring threat, the Hurricanes outshot Minnesota 34-25 and controlled the tempo from the outset. "There were some unforced errors," Wild coach Bruce Boudreau said, "and if we want to have any hope, we can't have unforced errors at this point in the season." The first period was scoreless only because Dubnyk kept it that way, making a string of highlight-reel saves_including stopping Svechnikov on a breakaway_to keep Carolina off the board. Just over two minutes later, following a Wild turnover at centre ice, Justin Williams fed Pesce at the top of the left faceoff circle and Pesce finished with a wrister past Dubnyk's glove into the upper-left corner to make it 2-0. "It was big getting those first two," Teravainen said. "We had a lot of good chances but their goalie played pretty good at the start. But when we got a couple it was a good feeling seeing the puck finally go in, and the confidence builds." Teravainen added the final punch when he intercepted a pass at the Minnesota blue line and beat Dubnyk with a backhander on a breakaway. The Hurricanes' third-period outburst stood in stark contrast to their previous game, when they had a one-goal lead against Nashville entering the third period and surrendered four unanswered goals. "That was the way to play in the third," Carolina coach Rod Brind'Amour said. "They were grinding. They're in playoff mode." NOTES: Teravainen recorded his 50th assist of the season on Jordan Staal's goal, and Sebastian Aho recorded his 50th assist on Pesce's goal. They became the first Hurricanes teammates with 50 assists in the same season since Brind'Amour and Ray Whitney in 2006-07. ... Williams notched his 300th career point with the Hurricanes. He became the ninth player in team history to reach that mark. ... Wild F Joel Eriksson Ek (lower-body injury) missed his sixth straight game. He is day to day. ... Carolina improved to 10-3-1 in its last 14 games. ... The Wild have won just three of their past 11 games.